The Hillsdale College Chargers began their G-MAC schedule by splitting a pair of road games against Cedarville Uni­versity and Tiffin Uni­versity. On Nov. 29, the Chargers fell to Cedarville, 76 – 60, and on Sat­urday, Hillsdale beat Tiffin, 74 – 65 for its first con­ference win of the year. The Chargers almost came away empty on the Ohio road trip, and trailed by as many as eight points in the third quarter on Sat­urday. 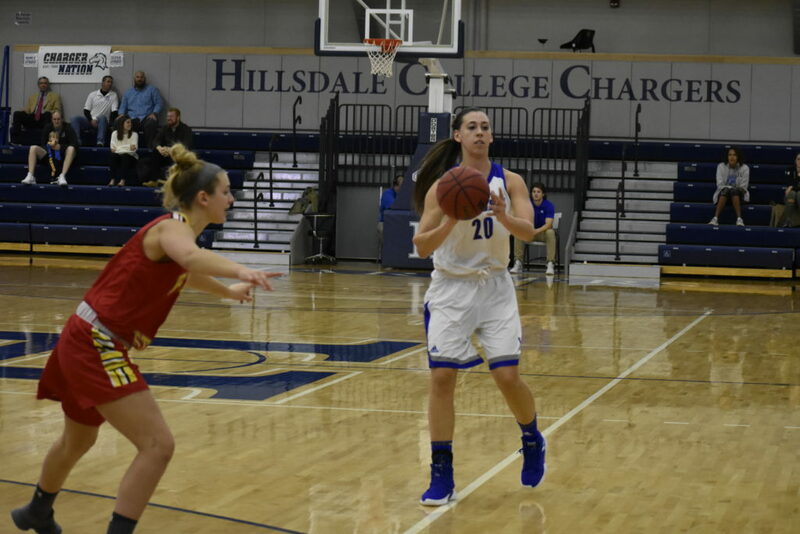 But senior forward Brittany Gray’s back-to-back three pointers brought Hillsdale within a single pos­session, and the Chargers led by the end of the third quarter. Hillsdale pulled away in the fourth quarter, and head coach Matt Fritsche said the team’s full potential was on display in the comeback. Gray nearly recorded a double-double, fin­ishing with nine points and 11 rebounds. Fritsche said getting rebounds on their opponent’s first shot was a big factor in the win. The Chargers have grabbed 73.5 percent of rebounds on the defensive glass, second-best in the con­ference behind the Uni­versity of Findlay. Senior guard Allie Dewire, in her second game back from a con­cussion that held her out for four games, scored a season-high 21 points, making seven of nine shots from the field, and six of nine free throws. Coming off the bench to score 20 points was freshman guard Grace Touchette. Touchette started at point guard while Dewire was injured, but didn’t seem to miss a beat in a dif­ferent role. Senior forward Makenna Ott added 14 points and eight rebounds in a steady per­for­mance. The Chargers shot 50 percent from the floor in the second half, com­pared to just 37.5 percent in the first half. Hillsdale also made six of 11 second-half three-pointers, and leads the G-MAC early in the season in total three-point field goals made. Gray added that Tiffin’s style of defense allowed the Chargers to dictate the pace and produce the offensive looks they desired. Tiffin made just 36 percent of its shots from the floor in the second half. 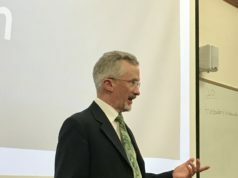 Fritsche said his team’s defense was able to force Tiffin into uncom­fortable and con­tested shots. Through seven games, Hillsdale has five players that are aver­aging double digits in points per game. Ott and Gray are aver­aging more than 11 points per game, and Dewire, along with Touchette and freshman guard Lauren Daf­fenberg, are aver­aging more than 10 points per game. Touchette has started four of the team’s seven games, and Daf­fenberg has come off the bench exclu­sively this season. Both already have 20-point per­for­mances this season. The Chargers host Malone Uni­versity tonight for their G-MAC home opener. Tip-off is at 5:30 p.m. Hillsdale defeated Malone in its only matchup last season, 66 – 62. On Sat­urday, the Chargers host Walsh Uni­versity at 1 p.m. Hillsdale split two games against Walsh last season, but beat them at home last December, 87 – 74. The remainder of the team’s games this month will all be in Hillsdale, with three more games between Dec. 13 and Dec. 30.